The Hope in Leaving is an incredibly powerful offering, delivered with rare grace and strength given its painful subject matter. With it, Williams has proven the most powerful storytelling is that which trusts readers to feel its impact without instruction, and find meaning without guidance. A Canadian-born actress's account of how she survived—and then left—an impoverished and dysfunctional family. When Williams was 24 years old, she decided to leave her hard-luck family to follow her dream of becoming an actress. But on the day of her departure, she discovered that her brother Randy had killed himself with a shotgun. 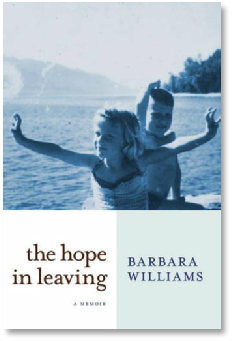 In a narrative that moves between the events surrounding the aftermath of that death and her past, Williams tells the story of her troubled family. Her mother, Simone, was a trade school dropout who exchanged "a future vocation for immediate affection" with Jack, a hard-living, hard-drinking man who worked primarily as a logger and occasional day laborer. Throughout the author's childhood and adolescence, the couple moved more than 25 times and had more children than they could afford. Over time, Jack took to living part-time with the family, causing even more instability. Poverty and injustice dogged them at every step as the relationship between Williams' parents deteriorated and a desperate—and desperately unhappy—Simone tried to commit suicide. The one person in the family who seemed most affected by their problems was her sensitive, musically gifted brother Randy, who began hearing voices and cutting himself in his late teens. Though Williams herself showed musical promise as a singer, she dropped out of high school believing that "the [only] way to get ahead was to get to work." However, her involvement in community theater brought her an opportunity to study drama at a theater school. Part of what makes this book so compelling is the tragic mirroring Williams depicts between herself and her brother, both of whom found liberation from their family but in radically different ways. Searingly honest, the book is a testimony to one woman's resilience and ability to love in the face of unimaginable hardship. An unsentimentally candid memoir of hope and determination.